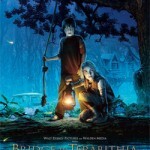 Bridge to Terabithia is a movie that is not short on emotion. It is the story of a boy that longs for the attention of his father, and a new girl in school with an imagination that stretches beyond many. The girl’s name is Leslie Burke, portrayed more than adequately by AnnaSophia Robb. She’s the daughter of a couple of writers, and shares in their knack for creativity. The boy is Jesse Aarons. He has some trouble with some of the kids at school, and doesn’t seem to have any friends. Until Leslie came to town, he seemed to find the solace of friendship within the characters that he created through drawings and artwork. Jesse has a couple of older sisters that seem very typical for their age group, and a younger sister named May Belle. May Belle looks up to her big brother as a protector. She also receives the attention from their father that Jesse desires. Jesse and Leslie become friends and escape to a world inside their own imaginations. They follow a path that leads over a river and into an old part of the forest near their homes. It is there that they imagine a whole assortment of wondrous creatures and have their adventures. This isn’t an actual other world, like Narnia, however. It is that place that kids, and some adults, would go to when playing with toys or outside. Suddenly their own imaginations would fill in the gaps and they’d see the most wondrous of creatures. 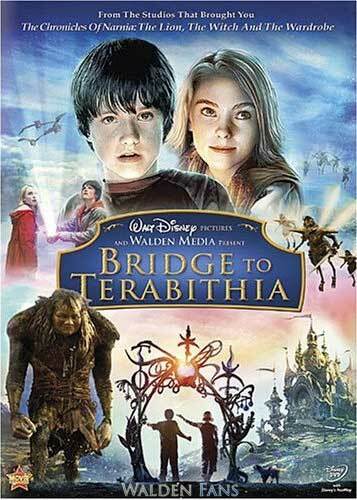 That’s only part of the overall story that is found in Bridge to Terabithia. I give the film a solid A, and my highest recommendation. I do believe that it should be viewed by parents prior to showing it to any children that you have, because it has some very heavy topics that you’ll end up discussing. The Features: There’s not a lot on this DVD, but there doesn’t need to be a whole lot. The author of the book and her son, who the story is based on, feature on the DVD as a very nice way to make the story all the more real. You see, the author wrote the book to help her son deal with something that we never want to have happen. The features are short, but to the point. There are also two audio commentaries. I’ve not gotten a chance to listen to them as of yet, but I plan on it, and will update this review as soon as I complete it. All in all, I highly recommend this DVD for anyone. 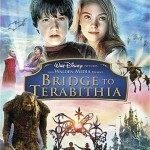 Just don’t expect it to be another Narnia. It’s not. It is a fantastic story told well, and a very bittersweet ending that’ll probably leave you in need of some tissue.